You can watch educational videos I've made on my youtube channel. News! If you're a student wanting to work with me, please see the following advertisement! Students are motivated by the relationship between mathematics and the applications where it is most heavily used. In every lecture, recitation, or other meeting with students, I find myself using examples from my own expriences in industry and from science that highlight the use of mathematical concepts and show how they are important. It is of course possible to make progress in any scientific field without a proper understanding of the relevant mathematical theory, but this places one at a significant disadvantage. It is always my experience that knowing a "little more math" results in profoundly improved outcomes, so I encourage my students to try to use course material immediately. I do this by having them engage mathematical concepts in projects that are either realistic or actually used by practitioners in the students' desired field of study. I leverage considerable industry experience in this endeavor, and pride myself on collecting enough data from equipment I have available to create unique and interesting projects. This last point bears elaboration: since computers have dropped in price substantially, and processor clock speeds have not dramatically changed, manufacturers have added value by adding more extensive sensors to consumer electronics. Many of these sensors are easy to program and yield interesting and compelling datasets on which to build projects. Although I supply the data to the students and assist them with the processing of this data, it is immediately clear to them that "no special widgets" need to be purchased. In particular, all of the projects outlined on this page feature data that was collected on an inexpensive netbook (an Asus EEE 901) or a smartphone (Nokia n900). 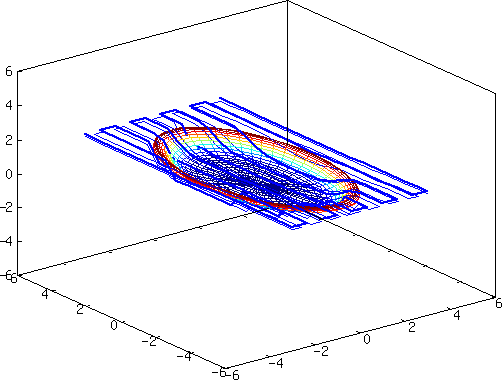 I have found that students readily rise to the challenge of learning simple programming in Matlab or GNU Octave without much complaint. My project instructions give them extensive help, and I supply the more challenging (but irrelevant to the course objectives) portions of code. I am willing and excited to spend considerable effort aiding the students in debugging their broken projects. They learn that this doesn't bother me in the least. Ever since I began programming, debugging has always been a favorite activity of mine. Here are the sample instructions and data file for this project. How to compress audio by using a lower sampling rate. The first is sometimes of practical interest: there are improvisational recordings to which it would be useful to obtain sheet music for later reference. The second problem, that of compression, is always of practical import, and in this project, the students make use of the famous Nyquist theorem to save on space after the harmony extraction is done. The project consists of a data file containing a violin and cello duet of a piece of children's music. 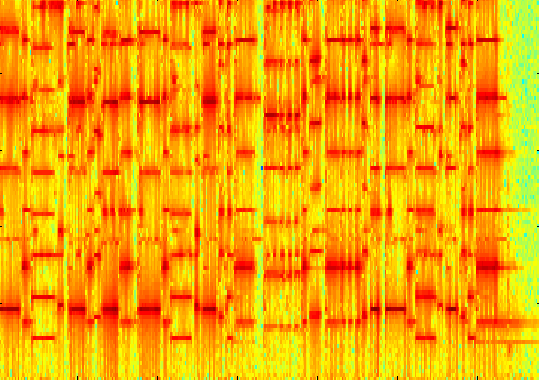 When the students construct a windowed FFT of the data, they can visually identify the cello notes (the bright spots along the bottom of the image) and filter them out for inspection. The project then asks them to compress this filtered dataset since it uses substantially lower bandwidth than necessary. Handheld GPS devices are great fun and very easily available. Many people have them on their phones, and some of these output a running history of where they've been (only on request, one hopes...). Using these GPS tracks, one can do a surprisingly good job of piecing together a story about what the tracked person or object was doing, if good maps are available. I used the GPS built into my phone to collect a history of my errands around campus one particularly busy morning. 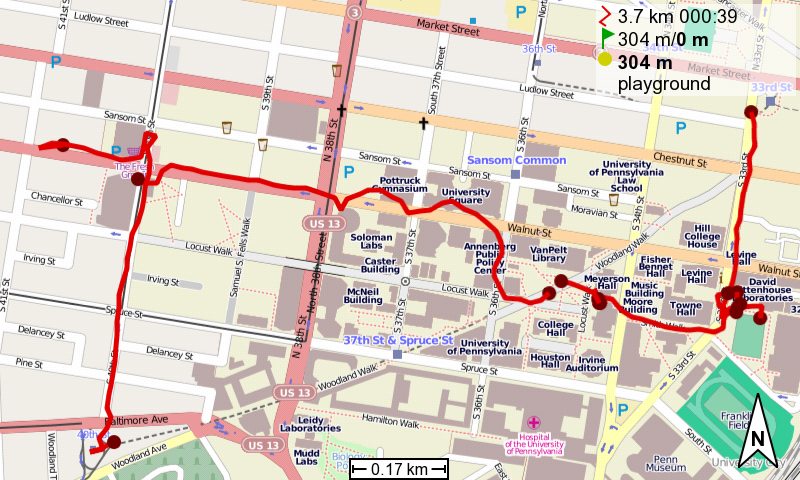 The students were given a GPX formatted file containing points along the track shown in the picture at right, which represents where I went. There are a few columns of data in this file, corresponding to the latitude, longitude, elevation, and time when my GPS recorded my location. Determine how far I actually walked (as opposed to taking public transit). But that isn't quite enough fun! So additionally, I asked the students if they could play the role of "big brother" and figure out exactly what I was doing. For instance, after running my errands, I was quite hungry. Unbeknownst to me, it was still early enough in the day that no restaurants had opened! This caused some moments where I was standing still for no apparent reason, though a little detective work with the timestamps and the hours of nearby establishments could solve this riddle. Additionally, my track actually cuts from the lower left corner of the image to the upper right corner abruptly. All of my students immediately figured out that I had been on the underground trolley! Here are the sample instructions (no data file) for this project. In this project, I gave the students a parametric description of the surface of an attractive bowl. It is tricky to avoid commanding the tool to accidentally drill into the object you're machining. This requires an accurate change of variables from the parametric surface description into the coordinates where the blade of the tool operates. To make this conversion, you have to solve a system of nonlinear equations. I suggested that the students use a multi-dimensional Newton's method, as we had discussed in class before the assignment of the project. This task turns out to be fairly intolerant of clerical mistakes (as I found out when writing the project before giving it out to the students), so I supplied the students with separate programs that test their output, essentially unit tests. This encourages the project to be built in modules, and to ensure correctness of each module before attempting to assemble. Of course, this idea isn't the least bit new! I learned it from both industry (where it is extremely common) and from a colleague, Dr. Dietz. Website content (c) 2017 Michael Robinson; all rights reserved. The information on this website reflects the views of the author alone and should not be construed as advice.